The British press has written a lot in the past week about Prime Minister Theresa May’s tour of African countries. Mind you, not so much about the diplomacy that the leading Tory politician portrayed or even the trade deals she agreed upon, but rather about Ms. May’s dancing which immediately earned a top spot in the ‘worst dances by politicians’. It is by now all over Youtube, we invite you to have a look at how she compares to former Russian President Boris Yeltsin’s drunken escapades. Of course, Ms. May’s advisers should have told her that dancing and visits to African nations go hand in hand but seeing the ‘robotic’ moves that she put in, this was clearly forgotten. 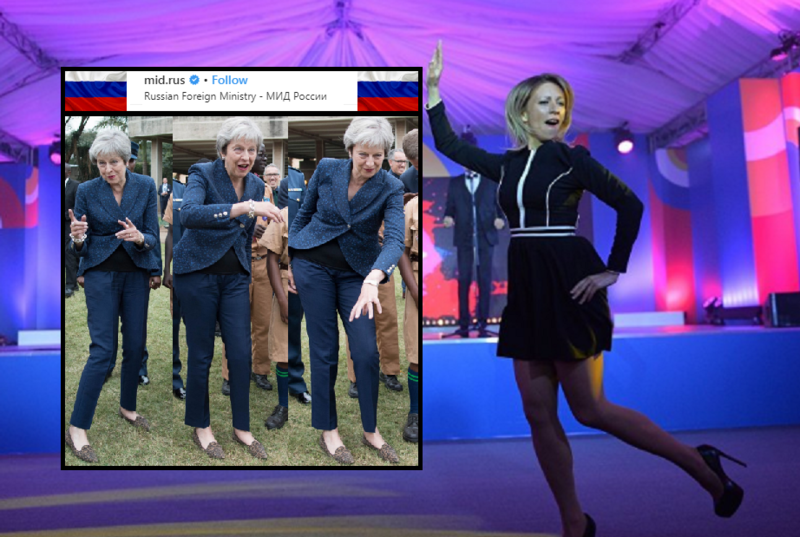 The dance moves of the ministry spokeswoman Miss Maria Zakharova (which took place in 2016 during the ASEAN-Russia summit in Sochi) and British Prime Minister Theresa May are hilariously compared, although we doubt the UK Parliament will find it less funny that the Russians are busy mocking them on social media in the midst of an international spy scandal.